After a great Plyo workout this morning, my breakfast had to be filled with lots of protein and carbs. So, what better way to do that then with some eggs, veggies and fruit?! This simple and easy meal did not disappoint and will definitely keep me fueled for the rest of the day. Scramble two eggs in a pan over medium heat. Add in diced tomatoes, parsley, red pepper and yellow squash until cooked to your liking. Meanwhile, cut one piece of Panera Bread Sourdough Loaf and toast. 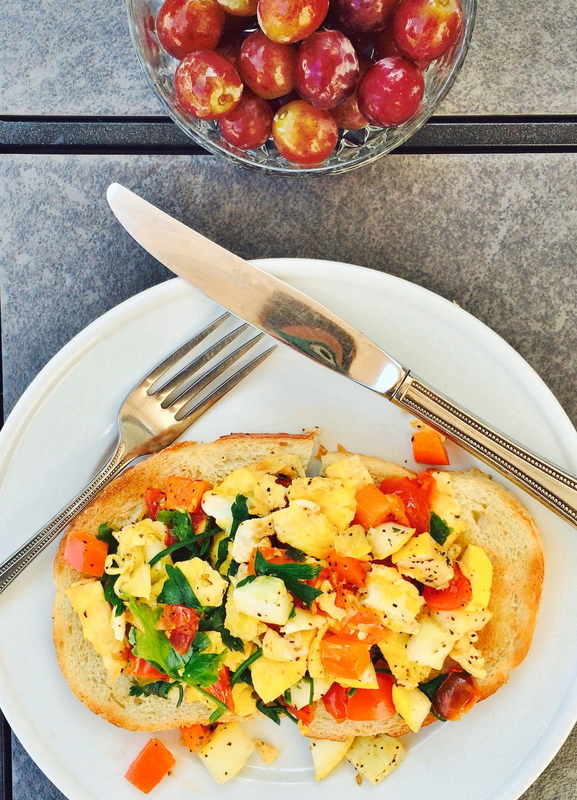 Slice toast, top with your veggie scramble and sprinkle with some salt and pepper. Easy peasy! Bon appétit!